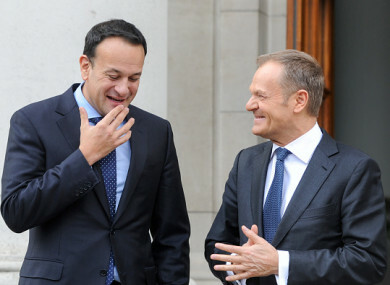 Taoiseach Leo Varadkar and EU Council President Donald Tusk. THE PUBLIC IS somewhat split over the government’s handling of Brexit negotiations, a new poll has shown. More people think the government is doing a good job than a bad one on Brexit but the number of people unsure means those feeling positive are not in the majority. A new poll carried out on behalf of Claire Byrne Live and TheJournal.ie found that 44% of people are happy with the way the Irish government is handling Brexit negotiations. Just under a quarter of people (24%) are not happy with how the government is handling Brexit while 32% of people said they didn’t know. On Thursday, President of the European Council Donald Tusk reaffirmed the EU’s support for Ireland’s position on Brexit. The future of the Irish border post-Brexit was always going to be a central plank of negotiations but it has only really become the dominant sticking point since late last year. In December, a deal between the EU and the UK agreed that UK would maintain regulatory alignment with the EU’s customs union if the UK could not come up with a solution for Northern Ireland that avoided a hard border. But the Irish government’s stance has been criticised by some with the DUP labelling it as “cynical, aggressive and green”. Email “People are unsure if the government is doing a good job on Brexit”. Feedback on “People are unsure if the government is doing a good job on Brexit”.